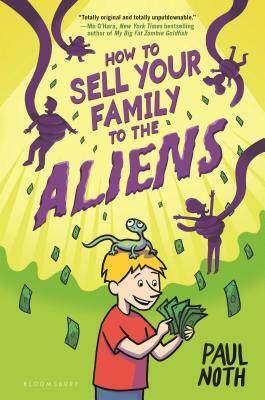 Paul Noth, "How To Sell Your Family To The Aliens"
From popular New Yorker cartoonist Paul Noth comes a laugh-out-loud, illustrated middle grade series about a boy who accidentally sells his large, unusual family to aliens. Happy Conklin Jr. is the only 10-year-old who has to shave three times a day. Hap's dad is a brilliant inventor of screwball products, and being a Conklin kid means sometimes being experimented on. So Hap has his beard, and his five sisters each have their own unique--and often problematic--qualities too. And although Hap's dad has made a fortune with his wacky inventions sold via nonstop TV infomercials, all of that money has gone to Hap's tyrannical Grandma. While she lives in an enormous mansion, the rest of the family lives in two rooms in the basement. All Hap has ever wanted is to have a normal life, so when he sees a chance to get rid of Grandma, he takes it! He only means to swap out Grandma, but when he--oops!--sells his whole family to the aliens, he wants nothing more than to get them back. He just has to figure out . . . how? Paul Noth’s cartoons have appeared regularly in The New Yorker since 2004. He has created short animated films for Late Night with Conan O’Brien, and been an animation consultant for Saturday Night Live. If you're unable to attend the event and would like a signed copy of How To Sell Your Family To The Aliens, please purchase the "Signed" version below. Paul Noth is one of forty featured authors or illustrators appearing across the country during the 99th anniversary Children’s Book Week, which runs from April 30th to May 6th. High quality canvas tote bag ideal for school, work, grocery shopping, or going to the beach with your favorite book.